CLEVELAND – Freddie Kitchens has always been a straight shooter. And for nearly 45 minutes, Monday, as Kitchens met with the media for the first time as the team’s head coach, he continued to be himself, which is exactly what earned him his first head coaching job in the first place. “I really stressed to John and everybody involved in this search and interviewing these coaches, I wanted a thorough search,” Kitchens admitted. “I really wanted to compete against everybody that wanted this job and that was a legitimate candidate for his job. I wanted it. And I wanted to go in and state my case. “I was very proud that everything I put in my book [for the interview] was my words, from my typing. I’m proud of that, because every word I had in there was my words. And then I get in there and I don’t use it, because I know everything that I’m going to say. I believe that they believe they made the best decision. That decision to name Kitchens the 17th head coach in franchise history was a unanimous one according to general manager John Dorsey. All he and the search committee needed was the stamp of approval from ownership and when they presented Dee and Jimmy Haslam with their decision he was on board. 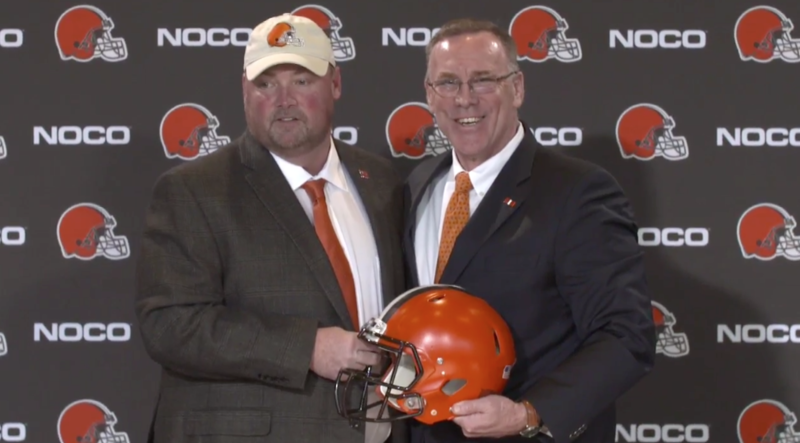 “At the end of the day, unanimously, the committee, we went to ownership with the suggestion to have Freddie Kitchens as our next head coach and they embraced it,” Dorsey said. It’s a promotion no one could have seen coming. Three months ago Freddie Kitchens was just a guy who coached running backs on the Browns. So when he was named offensive coordinator eight weeks into the season after Hue Jackson and Todd Haley were dismissed, fans likely found themselves asking “who?” Even Dorsey owned up to the fact that Kitchens wasn’t on their radar when that pair of firings went down. And then, even after leading a more efficient Browns offense over those final eight games of the season – on way to a 5-3 record – his lack of experience as a play caller left many people weary over whether or not Kitchens was “ready” to be a head coach. “Am I ready or not: I don’t know,” Kitchens asserted. “Were you ready to be a parent? I know [the committee] had confidence enough in me that I would figure it out and I’d get the job done. Locally at least, Kitchens has become a very popular man already though for his efforts in developing Baker Mayfield over the second half of the season and his blunt, tell it like it is personality. His popularity surely grew more on Monday as he won the press conference with talk of Super Bowls and never being a finished product. He had a message for those who think a 7-8-1 season is something to be happy about too. Still, he recognizes where it comes from. The Browns aren’t exactly the image of success in the NFL. The franchise is just year removed from a rock-bottom 0-16 season after all. Kitchens vowed that the dark times are over though. Another thing that won’t change as Kitchens steps into his role as head coach, he’ll continue to be the primary play caller on offense. Kitchens admitted as much early on in the press conference, just hours after the team announced the hiring of Todd Monken as offensive coordinator. As far as the structure of power within the organization goes, collaboration between coach, GM and ownership is the key, more so than who reports to who. By all accounts, Kitchens passes his first test with rave reviews. He withstood 45 minutes of questioning, stayed true to himself and answered everything perfectly. But as his predecessor proved, winning press conferences doesn’t mean much of anything on Sundays in the fall. Kitchens made a grandiose first impression as head coach. Now, he know he has to deliver. What Browns Players Currently on the Roster Have Earned Contract Extensions?